The event is taking place in New Orleans in November. THE ORGANISERS OF a Famine Commemoration Gala dinner taking place in New Orleans in November say that it will be a “very sombre and very respectful” affair. Arts, Heritage and the Gaeltacht Minister Heather Humphreys is expected to be among those gathering at the city’s Gallier Hall on Saturday 8 November for a night that will include “food from some of New Orleans’ finest restaurants and beverages” as well as a ‘patron party’ for those who pay for higher-priced tickets. Ticket prices for the gala dinner start from $125 for a single general admission ticket and go up to $275 for a Patron party single ticket, with a VIP table for 10 costing $2,500. The gala is being organised by Irish Network New Orleans (IN NOLA). Its president and founder is Adrian D’Arcy, an Irish emigrant and lawyer who said the organisation was founded in 2011 and is part of an Irish network of groups. “It’s going to be a commemoration of all those that died but a celebration also of those that made it here and the impact it had on New Orleans when they got here,” said D’Arcy. He said that New Orleans was one of the main three cities that Irish emigrants fled to during the Great Famine. Asked about how the gala can balance being a black tie event and commemorating a dark time in Irish history, D’Arcy said “it will initially be very sombre and very respectful”. He added that the organisers have discussed the tone of the event in detail. “It’s our aim in the Irish Network to make sure it is a very respectful evening”. He said there will be a minute’s silence for Famine victims at the gala, and that former Ambassador Hugh Swift will speak about the Famine at the event. As the night goes on, the tone will change from commemoration to celebration. While [the Famine] was a horrible event in Ireland and should never happened or happen again, Ireland’s loss was America’s gain and New Orleans’ gain. From [the] Famine, something good out here did arise. The Irish have thrived in the USA and in New Orleans since then. It’s a hard, difficult kind of thing to do be respectful and commemorate but we intend to, along the lines of history, commemorate and celebrate. Michael Blanch, chairman of the Committee for the Commemoration of the Irish Famine Victims, is involved in the commemoration walk for Irish Famine victims and emigrants memorial day next May. He said that he is happy to see the banquet go ahead as “it is bringing awareness of famine in other countries”. He said he would “have no issue with it, so long as it’s done appropriately”. The black-tie gala is described as one of the highlights of the 2014 International Irish Famine Commemoration (IFC), taking place in New Orleans from 6 – 9 November this year. “The ball is an accumulation of a year’s work,” continued D’Arcy. He said that a portion of profits from the gala event will be distributed to local charities that provide hunger relief, and another portion will go towards IN NOLA’s scholarship programme, which involves sending a New Orleans teen to Ireland for a time. The event will be attended by the Irish Ambassador to the United States and other high-profile guests, although President Higgins, who was invited, cannot attend. The band Black 47, named after the worst year of the Famine, are to be flown in for the event. Entertainment will also include musician Tara O’Grady and local musicians, and a former dancer from Riverdance. Part of IN NOLA’s work has been raising awareness of the Famine, said D’Arcy, including holding workshops in the city, educating ‘ambassadors’ who will in turn educate others on the event. The hope is that some of the events, such as a business breakfast on Friday morning, will lead to business connections between Louisiana and Ireland. A spokesperson for Minister Humphreys said that the Minister will attend a number of events as part of the commemoration, including a conference, wreath laying and tour of the communities where Irish arrivals during famine times sought shelter. “As is clear from the programme outlined above, the programme of events focuses on commemorating the victims of the Famine in a respectful and appropriate way,” said the spokesperson. 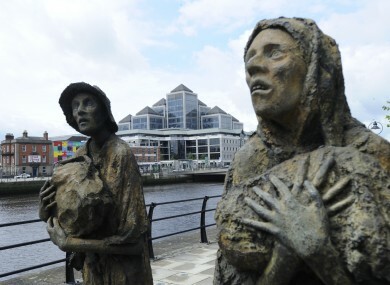 This is in keeping with the aim of the Commemoration to honour the victims of the Famine, raise awareness of hunger issues in the world today and also to ensure that the contributions of those who emigrated and of their descendants abroad are appropriately celebrated. Email “$125-a-ticket Famine Commemoration Gala dinner will be a "sombre, respectful" affair”. Feedback on “$125-a-ticket Famine Commemoration Gala dinner will be a "sombre, respectful" affair”.